Official recognition of baseball’s best pitcher did not begin until 1956, when Brooklyn’s Don Newcombe won the first Cy Young Award. Starting in 1967 two awards were given, one to the best pitcher in each league. While there was no official vote in 1951, two retrospective attempts have been made to determine the likely pre-1956 Cy Young winners for each league. The two, one by the Society for American Baseball Research and one by awards historian Bill Deane, agree that the 1951 winner in the National League clearly would have been the New York Giants’ Sal Maglie. Because there was no separate award for them, pitchers were always well represented in the MVP voting. The pitcher with the highest MVP vote total was usually the winner of the Retroactive Cy Young Award. Therefore, it’s likely that because Maglie was the highest finisher among pitchers – he was fourth – he would have finished first in a Cy Young vote. Larry Jansen (23-11) was the only other Giants pitcher to receive MVP consideration, finishing 14th. Maglie, a 34-year-old right-hander, was in his second full season with the Giants, after serving a five-year suspension for having left Organized Baseball to pitch two seasons in the Mexican League. Maglie (23-6) tied teammate Jansen for the league lead in wins, while finishing second in winning percentage (.793) and earned-run average (2.93). He also allowed the fewest hits per nine innings (7.67), was second in games started and complete games, and third in strikeouts and innings pitched. Though not particularly effective, he was the winning pitcher in the All-Star Game. 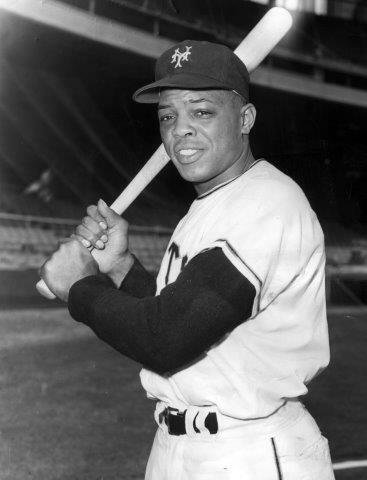 Center fielder Willie Mays of the New York Giants won the National League’s Rookie of the Year Award for 1951 after being selected by 18 of 24 members of the Baseball Writers Association of America. Three representatives from each of the eight NL cities got to choose the winner. The Giants had opened the season with Bobby Thomson in center field, but when they struggled for the first month, manager Leo Durocher sent for Mays and moved the versatile Thomson to left and later to third base. Willie had begun the season with Minneapolis of the American Association, where he was batting a stunning .477 after 35 games. He made his major-league debut on May 25, just 2½ weeks past his 20th birthday. It took Mays a while to get adjusted to big-league pitching, but once he did he was a major asset in leading the Giants to the pennant. Mays batted .274, with 20 home runs and 68 runs batted in. His fielding was spectacular and he exhibited great speed and daring on the bases. Boston Braves left-hander Chet Nichols, the league’s earned-run average leader, finished second to Mays, with four votes. The remaining two votes went to Brooklyn Dodgers right-hander Clem Labine. 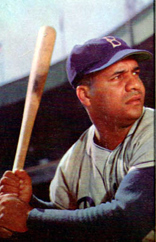 The National League’s Most Valuable Player Award for 1951 went to Roy Campanella, though fewer than half the voters placed him at the top of their ballots. The voting members of the Baseball Writers Association of America gave the Brooklyn Dodgers catcher 11 of the 24 first-place votes. They scattered the other 13 among seven players, including three members of the Giants. Stan Musial of the St. Louis Cardinals received only two first-place votes, but his combined total of 191 points placed him second to Campanella’s 243. Giants outfielder-first baseman Monte Irvin, who batted .312 and led the league with 121 runs batted in, finished third. Irvin had 166 points, including five first-place votes, second only to Campanella. 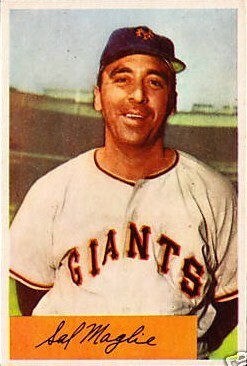 Right-hander Sal Maglie of the Giants finished right behind Irvin, with 153 points. Maglie, a 23-game winner, received one first-place vote. The third member of the Giants to receive a first-place vote was Bobby Thomson, who, like Maglie, got just one. The outfielder-third baseman, a .293 hitter with 101 runs batted in, finished eight with 62 points. Two other Giants received some support from the writers. Shortstop Alvin Dark finished 12th, with 30 points, and pitcher Larry Jansen finished 14th, with 26 points. Dark, the captain and team leader batted .303, while Jansen’s 23 wins tied Maglie for the most in the league. LYLE SPATZ has written and edited several books of baseball history and biography and has edited two baseball record books. He has been a member of the Society for American Baseball Research since 1973 and chairman of SABR’s Baseball Records Committee since 1991.